Winning Futures is an award-winning nonprofit organization providing youth mentoring activities through training handbooks and hands-on activities. The Winning Futures program pairs training handbooks with the youth mentoring activities contained in our student workbooks to create an interactive mentoring experience for youth and young adults. This hands-on approach to mentoring ensures that students are exposed to the skills they need to succeed personally and professionally. Our youth mentoring activities focus on critical life skills such as character value identification, goal setting, career preparation, strategic planning, job readiness and more. These activities have been proven to show statistically significant improvements in many key areas, including academic performance and desire to continue schooling to a higher level than originally planned. 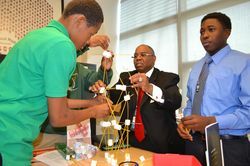 To learn more about Winning Futures and our youth mentoring activities, visit https://winningfutures.org or contact us.